Internet access you can rely on Telstra Internet Direct is a secure, high-performance internet service with exceptional availability and scalability. It is designed to support business-critical operations and provide a consistent, quality experience for your staff and customers. 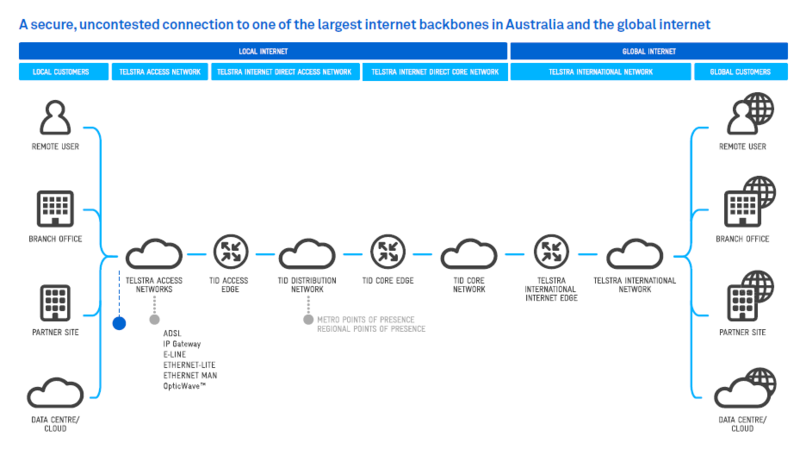 With Telstra Internet Direct, you have a dedicated, carrier-grade link to one of the largest internet backbones in Australia – providing greater national coverage – as well as the global internet. We offer more Points of Presence in Australia than other providers, plus more than 900 Points of Presence world-wide for ease and speed of access. Our high capacity network has full redundancy and inbuilt security, backed by proactive monitoring and management. You also have the assurance of 24/7 helpdesk support, while an online portal lets you view, troubleshoot and manage your service. Telstra Internet Direct gives you the flexibility to choose from a wide range of carriage types, speeds, usage and pricing, the option of IPv6 addressing, as well as a range of additional services. A choice of pricing plans Enables you to combine economy with performance. For Unlimited Plan Users: have greater flexibility through on-demand bandwidth features and your routers will have an enhanced feature for allocating bandwidth to your users. For ‘Limited’ Plans Users: gain greater flexibility from shared bandwidth allowances. Network Visibility online tool Allows you to assess your network path and routing information, and self-diagnose network issues without needing to contact us. To connect to Telstra Internet Direct, you must have a Telstra carriage service. The range of connecting carriage services that support Internet Direct include ADSL (Multi-Site), Ethernet Lite, Ethernet MAN, Ethernet Line, Optic Wave™, IP Gateway, and Managed Facilities-Co-location.